Craving Pizza? 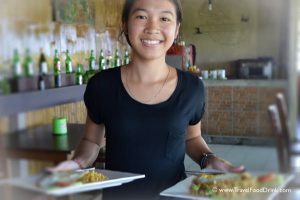 This well priced roadside Restaurant between Tanah Lot and Canggu may calm your Hunger! Note: This is an independent restaurant review based on my personal experience. 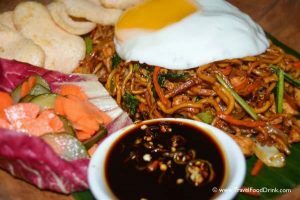 After a wonderful morning walking the park setting of Tanah Lot, we were ravenous and looking for somewhere to eat in the Canggu area. Driving along the Jl. 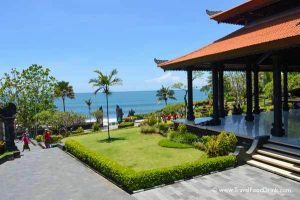 Prerenan-Tanah Lot highway, we eventually stopped at Warung D’Pererenan. 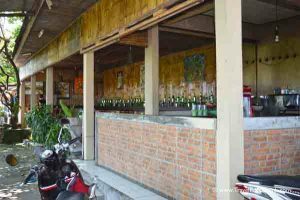 This is a simple, convenient roadside stop serving traditional Indonesian dishes, salads, pasta, burgers, steak and pizza. It is very noisy due to the constant passing traffic, but easy access, fabulous prices and lots of parking make it an easy choice. 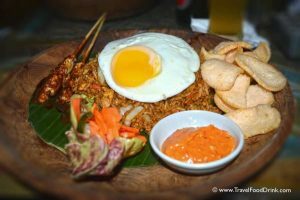 This is Indonesian Food without the Bali price! No complaints at all. All though the lovely ladies working could not speak any english, they tried very hard to understand and kept smiling through it all! 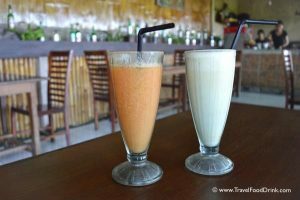 For drinks, we ordered a vanilla milkshake as well as a papaya juice. We kept switching, because one was as good as the other! 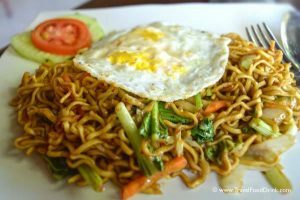 Along with the drinks, we asked for a Mie Goreng and a Nasi Goreng. Again, both dishes, although not huge, were more than filling and tasted delicious. If you have been following my blogs, you will understand why the following prices make this restaurant an all around winner. 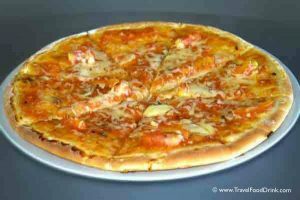 Later, we saw the pizza and although we had not ordered one, it looked quite tasty and is probably worth a try! 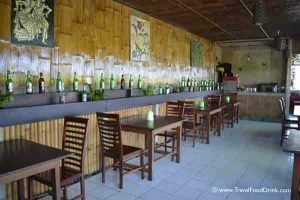 Do I recommend Warung D’Pererenan? Yes. Good food, fabulous prices! Seriously, did you see those prices? 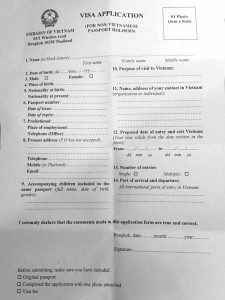 Where, How, Cost, Time Applying for a Vietnamese Visa while in Bangkok, Thailand. You will not actually be going into the Embassy, rather entering a yellow side service door which says Consular Hours (see pic). 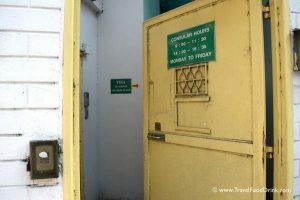 You do not need to ring the bell, just push the door open and walk in; the little visa office will be the second door (glass) on your left. Morning is a good time to apply. We went on a Monday morning at 10:45 am and there was one other western couple and a few Asians. 2 of the 3 service windows were open. – ?? We did not need to show proof of exit??? – A receipt is given. – Visa pick up is whatever day they tell you between 4 pm and 5 pm only. – Big smile and say thanks! 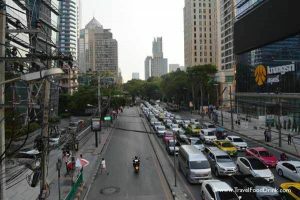 – Single-entry 90-day visas cost 3700 baht and also take 4 days to process. By BTS Skytrain, your stop is Phloen Chit. 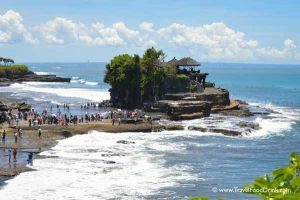 Not just another great Instagram moment, Pura Tanah Lot on the famous rock formation of the same name (Tanah Lot) and Batu Balong are something you do not want to miss if visiting Bali. It is a perfect blend of history, culture and beauty. 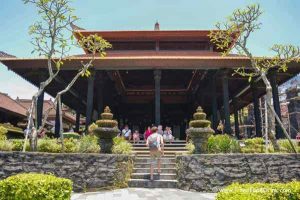 We hopped on our rented Motorbike and took the scenic 10 km (1/2 hour) drive from Sleepy Gecko Guest House in Canggu to the unforgettable park. Although it is not called a park, the setting is indeed a huge park area. 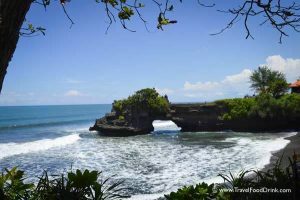 Also known as the floating temple, Pura Tanah Lot is a holy place where Hindus worship the Balinese sea gods and is protected by venomous sea snakes, or so the story goes. The entrance fee is 60,000 IDR / €3.60 / US$4.40 per person and includes parking. 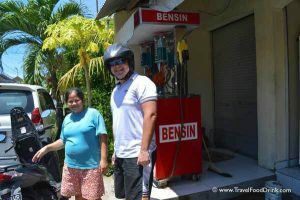 After finding a parking spot in the motorbike designated area, we came to a second entrance where you show your ticket. 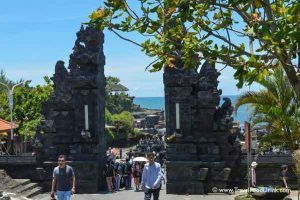 From there, you basically walk through a small “town” which is blocks of souvenir shops, cafes and restaurants before finally getting to the park setting. Cement walkways allow easy access along the cliffs above the sea. 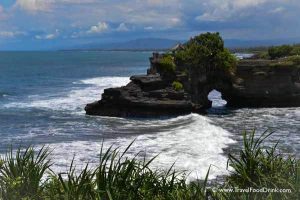 To the right is Batu Balong Temple and to the left is Pura Tanah Lot Temple. Lots of people are sitting on the grassy areas with shade trees, or on the many benches placed throughout. A huge Gazebo like building further up the hill allows for some great views and shade. Getting to the temples was not as smooth of a walk, but certainly worth it, even with the pressing heat and the pushy tourists. Tips: Dress respectfully, take sunscreen and wear sturdy shoes. Opening Hours: 7 days a week from 7 am to 7 pm. 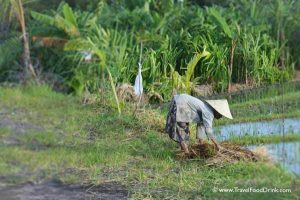 Finding paradise in Canggu, Bali. A delightful Guest House experience. 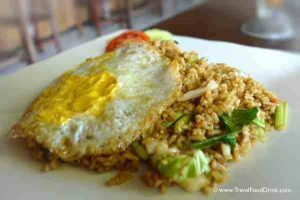 Note: This is an independent hotel / guesthouse review based on my personal experience. 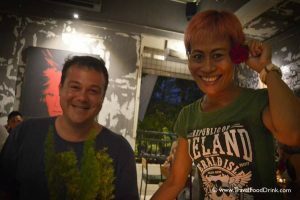 Our host Putu, met us on arrival; as we would discover during our time with her, she has a gentle kind spirit and a beautiful aura. 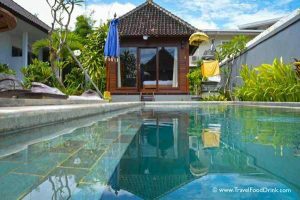 Due to availability, she graciously, without request or mention, upgraded us to the charming Wood Room villa. The Accommodation: The Wood Room features large glass windows facing the pool. A huge, romantic, queen sized poster bed is the focal point, while a wardrobe, side tables, tv/dvd player (more on that later), air conditioner, and fan provide appreciated conveniences. 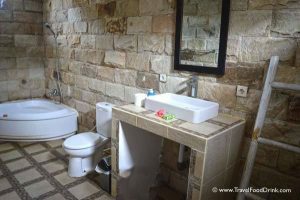 The rustic stone, spa style bathroom had a shower area, a soaking tub, sink and of course, a toilet. A small ladder provided a perfect drying rack for swimsuits and towels. A bar of soap, some liquid hand soap and towels were provided. A Community kitchen equipped with a good variety of pots, pans, dishes, flatware and glasses along with a two burner stove was well appreciated by the guests. Thoughtfully, drinking water is available to use as needed. Just off of the kitchen, was an eating area with tables and chairs. We liked doing our computer work here in the breeze. It was a great place for socializing too with other guests and our host. The refreshing swimming pool was a god send on most of the hot, humid days and we really used it – a lot. 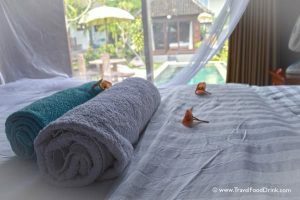 Surprisingly, only one other guest seemed to appreciate it as much as us, which we had no problem with because it seemed like our own little paradise. The DVD Player in the room actually had a purpose. In the community area is a fairly generous movie library with old and new titles to borrow and watch. We had a movie night one evening after dinner and it was very relaxing. I assume if it rains, guests are very thankful for this thoughtful diversion. In addition to films, there is a small library of books to borrow as well. 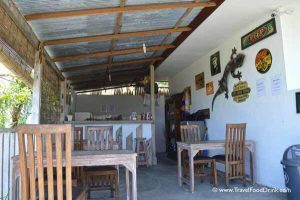 Sleepy Gecko Guesthouse also has Motorbikes for rent at 50,000 IDR / €3 / US$3.50 per day. We discovered very quickly that this affordable means of transportation is a necessity, so plan with it. 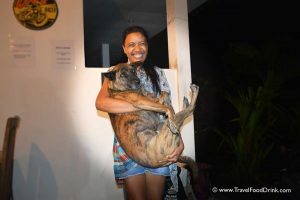 – Barking dogs, it didn’t matter whether you wanted to take a nap in the afternoon or were rudely awakened in the morning the dogs were often barking. – Watered down hand soap. I guess at the fantastic price, we can let it slide and be thankful there was soap at all. The Cost: Deluxe Double (our original booking) – 4 nights, 2 persons: 1,180,000 / €70 / US$87. That is a meager €17.50 / US$21.75 per day! 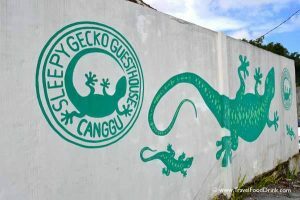 Do I recommend Sleepy Gecko Guesthouse? Definitely, it is an extremely affordable, clean place, within walking distance to a few restaurants, laundry service and an atm, not to mention all of the amenities. Thank you Putu! 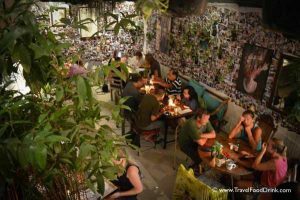 Casual Dining in Canggu Bali. In search of a unique atmosphere. The Restaurant: Easy to find at the side of one of the main roads. 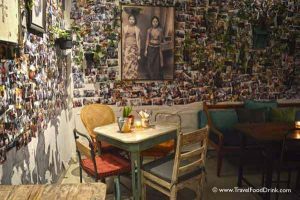 We walked in and immediately felt the chill vibe created through the photos on the walls, a mixed seating combo of lounge & dining, flowers, plants, and pop music beating in the background. Staff were all smiling and looked like they enjoyed their job! We visited in the evening and candles glowed softly on the tables. Downstairs was full, so we were led to an upstairs dining area. The Food: Dishes on offer include both Vegan and non-vegan options. 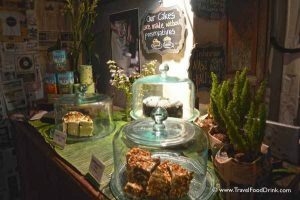 The Menu offers a nice variety of salads, Indonesian Cuisine, Burgers / Sandwiches, Wraps, Beef Steaks, Chicken, Lamb, Pork and a selection of cakes for the sweet tooth desert lover. 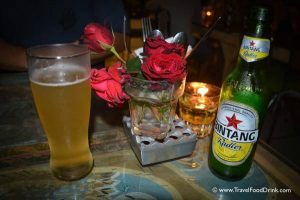 A great selection for those having a hard time deciding where to eat in Bali! The food itself was outstanding! It was so fresh and my tastebuds were in overload tasting through the incredible layers of flavour. The Service: Excellent! Professional, friendly, outgoing and aware. Do I recommend it? Yes. The food was really loaded with layers of awesome flavour and service is outstanding. If you are not too worried about high prices, but prefer to concentrate on really good tasty food, this is an excellent choice!